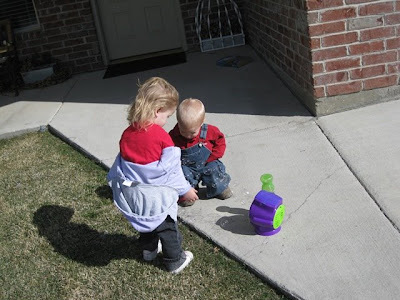 Last week, when it was beautiful weather, Gavin had fun playing with Brielle. 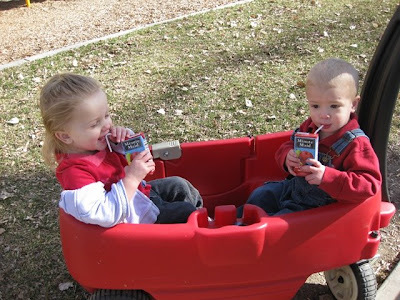 They went to the park, played with bubbles, and had a fun wagon ride. Gavin LOVES LOVES LOVES trucks. Or, as he says, "Gucks". We will be driving in the car, and he'll see a truck and yell "Guck! ", then when he can't see it anymore, he'll say "Bye Guck." 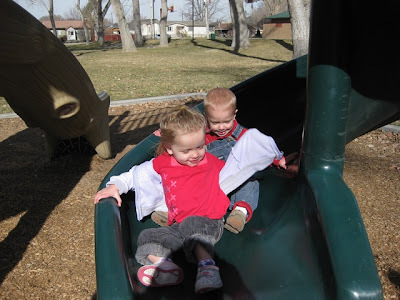 Last week, he went to the park with his little friend Brielle. He found a broken truck while he was there, and insisted on bringing it home. He loved the truck, and even wanted to sleep with the truck. So, Casey took him to Wal-Mart, and let him pick out a big truck. He was so excited about his truck. He carries it everywhere he goes, and he also insists on sleeping with it. What a boy! It's official...it's the first day of Spring! Too bad this beautiful weather isn't going to last. We have been enjoying this warm weather. 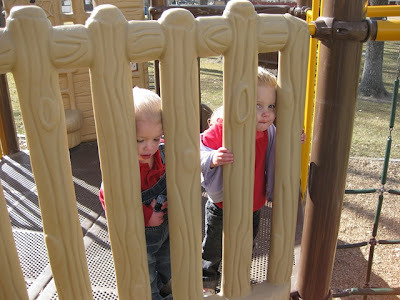 We went to the park, went for walks, played in the yard and today I even got out to weed. Gavin was such a big helper and helped me weed and Kyson just slept. I took some pictures of my boys today. 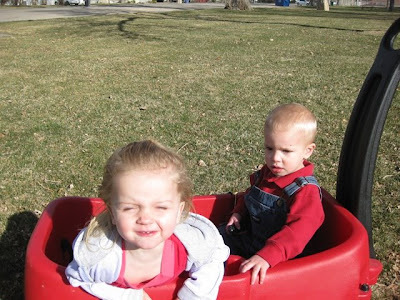 Kyson was an angel, Gavin was the one who was the stinker. He really didn't think it was too much fun. So hopefully I'll get more of the both of them later. I love it when babies wear hats. Here is Kyson sporting a cute little hat. For those who know Gavin, know that he is a mamma's boy. I thought he'd have a hard time adjusting to a new person taking my attention, but he has done really well. Today he was really cute and wanted to see "Baby". He kept going in our room and peeking into the bassinet. A little later, I got Kyson up and was changing his diaper in his bedroom. Kyson started crying, and I could hear Gavin, who was playing on the stairs, say "Baby! Baby!" He came running up the stairs and runs into our room to check on the baby. He has already been a big helper by throwing the diapers away in the garbage, or hand me diapers when I am changing Kyson's diaper. Each day it gets a little easier, and hopefully that continues! Kyson McKay was born on Tuesday, March 3 at 4:04 pm. He was 7 lbs 2 oz and 19 1/2 inches long. This labor and delivery was SO EASY. I went into the hospital at 9:30 that morning to be induced. When the nurse asked me if I had any concerns, I just said, "Get me the epideral as soon as I feel pain." and she said, "How about before you feel the pain?" So, I didn't have to feel any pain, and pushing was so much easier the second time around. Only a few pushes, and he was here! He is such a good baby, and hopefully that continues. He sleeps really good and eats really good. He does spit up a lot, hopefully that is just temporary. He has about the same amount of hair Gavin had, but he doesn't really look like Gavin did when he was born. He has his own cute little look. It was fun seeing Gavin's reaction. He thought the baby was neat for 2 seconds, but he thought the room was much more fun to run and play in. He had no problem leaving us either. He had too much fun with Grandma and Grandpa Losee and Spence. 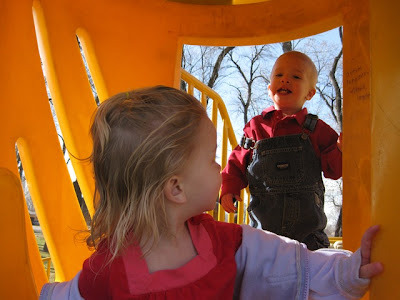 Things are great, but wish me luck when Casey goes back to work and I have to battle two kids alone! Happy Birthday Camille! She was so excited to have her new nephew born on her birthday. Brielle came to visit. 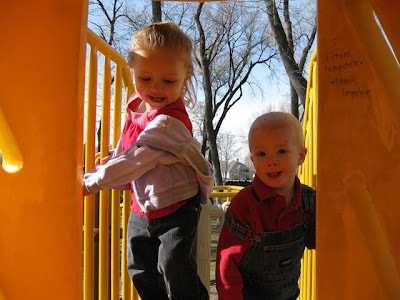 She and Gavin had fun playing together. Gavin holding his little brother. Dressed ready to go home!